Today, I am sharing with you one of the most famous Armenian pastries: bourma or sari burma, a close cousin of the famous baklava. Located between Georgia, Azerbaijan, Turkey and Iran, Armenia is a small country whose cuisine is a reflection of a three thousand year old culture, and probably one of the oldest in the world. The recipes of Armenian cuisine have a very long tradition, born from the love of a people for their land and traditions transmitted from generation to generation, and influenced by the diaspora of this people, in Europe, in the United States, and in the Middle East following the genocide of 1915-1917. The proximity of the Arab, Greek, Turkish, and Armenian cultures in the Ottoman Empire, the exile to the Middle Eastern countries, including Lebanon and Syria, as well as the contact with Russia have engendered mixed flavors of an excellent cuisine that was able to preserve its identity through the transmission of many recipes by the women of the country. Armenian women have developed the ability to use every cereal, legume, fruit or meat with special care and patience, skillfully combining their flavors and aromas to obtain tasty and refined dishes of a very colorful, varied and often elaborate cuisine. 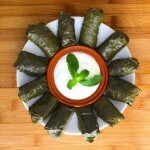 Western Armenian cuisine is very close to Lebanese, Greek and Turkish cuisines. For this reason, it is very common to find on the Armenian table all kinds of mezze such as falafel, hummus, taboule, mutabbal, taramosalata or dolma. As for the desserts, they are very close to Middle Eastern cuisine with baklava, lokoum (Turkish delights) and halva. You will also find Russian influences in Armenian cuisine, like with the famous Napoleon cake, which is none other than French millefeuille. Today’s delicious sari burma is also famous in Turkey where it bears different names: sarığı burma (twisted turban), dolangel, oklava tatlısı (sweet roll of pastry), burma tatlısı (twisted dessert). In Armenian, sari burma means “golden twist”. It probably owes its name to the particular preparation technique and the way we twist, push and wrinkle the dough to get these sweet little jewels. 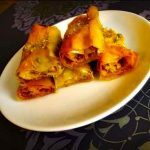 This recipe of sari burma is, I admit, the first recipe of a long series that reconciled me with these sheets as thin as tissue paper: filo sheets (or phyllo). Because of their fragility and many misses, I had stayed away from them for a long time. In Armenia, these sheets are said to be so thin that one could almost read the newspaper through it, that is to say the number of sheets that went straight to the trash before I even filled them! I’ve always wondered how you get such a pleated appearance for some pastries made with filo sheets as they are smooth and uniform before baking. Well, I quickly realized that it did not happen by magic and that’s what attracted me to this recipe. I admit that after watching various tutorials, the technique amused me, and as a child in front of his first toy, I was eager to try it. Indeed, if I chose to make sari burma, it is mainly thanks to the “stick technique”. A simple stick of less than 1 inch in diameter, which helps roll and wrinkle this fragile sheet by twisting it, without breaking it. It does not matter which type of stick but one thing is sure, to make sari burma, it is necessary to use a stick! So I bought a wooden broomstick in a hardware store and in that same store, I had it cut to the right dimension, about 20 inches. 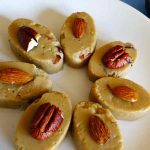 In addition to being a fun dessert to prepare, sari burma is just a delicious and sublime pastry. 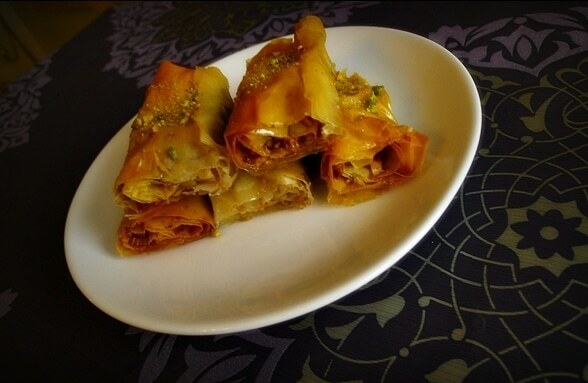 Sari Burma is a traditional Armenian and Turkish dessert that is very similar to baklava. Cut the butter into pieces. 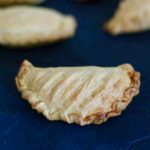 It is important that these pieces are all the same size so that the butter melts evenly and does not burn. Melt the butter over low heat. Pour into a container. Wait about 10 minutes. Using a large spoon, remove all whey, i.e. the foam that forms on top. Roast pistachios in a small dry skillet on low heat for about 10 minutes. Chop only after roasting. Line a baking pan or casserole dish with parchment paper. Line countertop with parchment paper. Take a sheet of filo and brush slightly half of the area with ​​butter, without pressing with the brush. Fold the sheet in half to form a rectangle. Mix nuts and cinnamon. Lightly sprinkle the dough with this mixture. Place the wooden stick at the bottom of the filo sheet (narrow side) and wrap loosely in order to obtain a roll of dough around the stick. Wrinkle the dough starting from the end and tightening toward the middle. Remove the stick. The roll of dough should be wrinkled. Using a sharp knife, cut the two to get a couple of cakes. Place each cake in pan and cover with fabric to prevent the dough from drying out. Also cover the filo sheets that are waiting so they do not dry out. Repeat the process with the remaining 7 sheets. Bake for 20 minutes until the cakes are golden. Prepare the sugar syrup while the cakes are in the oven. Put the water and sugar in a saucepan. Bring to a boil until the syrup begins to thicken. Remove from heat. While stirring, pour the lemon juice and orange blossom water. Immediately put back on the fire and bring back to a boil, stirring constantly. Remove the pan from the heat. Let cool a bit. Pour syrup generously over the cakes as they come right out of the oven. Sprinkle each cake with a little pistachio. I also found you can melt butter, then put it in the freezer, and just cut the whey off of it once it is frozen. Then the butter is clarified. Then melt it again.